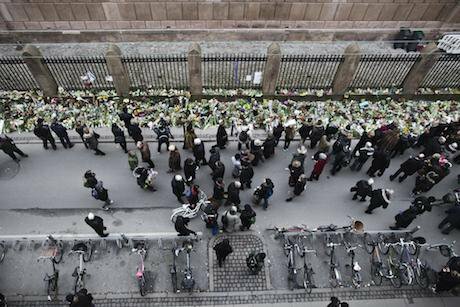 Danes commemorate victim outside Synagogue in Copenhagen. Demotix/Kenneth Nguyen. All rights reserved.It began so promisingly. Forty thousand people of all ethnicities, religions and political persuasions gathered peacefully to unite against the extremism that had just claimed the lives of two people at a free speech debate and a synagogue in Copenhagen. The speakers included prime minister Helle Thorning Schmidt, who stressed that “We are determined to stand watch over our values. We insist on protecting our freedom”. But the political reaction to the attacks on February 14 is difficult to square with the sentiments displayed by civil society and leading politicians at the mass memorial. In fact, the Danish government’s most concrete response has been the proposal of a series of measures that will undermine the very values that they insist terrorists will never succeed in displacing. On February 19, the Danish government presented a 12-point plan to counter terrorism (Denmark has already passed two comprehensive anti-terrorism bills in 2002 and 2006). Among the initiatives was a proposal to allow the Danish Defense Intelligence Service (DDIS) to conduct warrantless surveillance of Danish citizens abroad. The DDIS is responsible for both Denmark’s foreign and military intelligence. Among its working methods is sophisticated signal intelligence, though its activities are shrouded in secrecy with minimal legal or parliamentary oversight. Currently DDIS surveillance targeting Danes abroad requires a warrant, which must be obtained by the (domestic) Danish Security and Intelligence Service (DSIS) and issued by a judge. Only where the DDIS obtains information on Danes “by chance” is it allowed to include, share and process such information on Danish citizens in foreign parts. Accordingly, the government’s proposal – warrantless surveillance on Danes abroad – would have represented a significant shift in the powers afforded to the DDIS and the legal protection of Danish citizens. In fact, the proposed powers would have, legally speaking, exceeded those of the NSA, which since an amendment to the FISA Act in 2008 has been obliged to obtain a warrant from the FISA Court, when conducting surveillance of US citizens abroad. There may be good reasons why the DDIS should be allowed to listen in on Danes who have joined IS in Raqqa, but warrantless surveillance, a disproportionate measure in itself, would also open up the risk of abuse. For instance one could imagine a scenario where the domestic DSIS had a Danish citizen on the radar, but not enough evidence to obtain a warrant for surveillance. If that person was to leave Denmark for vacation, family visit or a business trip, the DDIS could gain access to this person’s communication and share the information with the DSIS, thereby circumventing the legal protection against warrantless search and seizures under Danish law. The proposal and the government’s arguments in favor of it also set an eerie precedent. While the prime minister grossly misrepresented the current powers of the DDIS, her Social Democratic Party’s spokesperson on defense affairs argued that court warrants were unnecessary since surveillance would have to be authorized by the director of the DDIS – “when the director says things are OK, it’s because there is a reasonable suspicion”. Accepting that logic, one could introduce warrantless surveillance at the domestic level. It also transpired that the proposal was not a new one, necessitated as a reaction to the attacks in Paris or Copenhagen, but rather one, which had been already proposed by the DDIS but rejected by the Danish Ministry of Justice as too far reaching. Its reintroduction was a classic example of how intelligence services use terrorist attacks to push for “scope-creep” of their powers. After much criticism and debate, however, the government was forced to back down and late on 17 March it announced that it would present a bill that includes a requirement for the DDIS to obtain a court warrant. This was a victory for a civil society willing to question draconian measures put forward by governments in the immediate aftermath of a crisis. The government's efforts, on the other hand, proved how the people’s representatives often cannot be trusted to guard the freedoms of their constituents when these freedoms are tested. The most extremes provisions of the intelligence bill might have been removed, but the fight is not over. This is because Danish politicians were not content with attempting to remove crucial safeguards against abusive and arbitrary violations of communications and private life. The values of freedom expression and association, the very principles attacked by the gunman when he targeted a debate on free speech, are also under threat. The terrorist attacks in Copenhagen were carried out by 22 year old Omar el-Hussein, who shortly before the attack shared a jihadist video and declared loyalty to the leader of Islamic State Abu Bakr Al-Baghdadi. While in prison he had also talked of wanting to travel to Syria and join Islamic State. Much evidence suggests that he was motivated by religious extremism. While the threat from Islamist extremism is not new, the attack prompted a political majority, joined by Danish Minister of Justice Mette Frederiksen, to demand the banning of religious fundamentalist group Hizb-Ut-Tahrir (HUT). There is good reason to closely monitor and vocally oppose the totalitarian ideology of HUT, whose ultimate goal is the establishment of a Caliphate ruled by religious dictates contrary to the most basic concepts of democracy. It is also true that members of HUT have promoted anti-Semitism: Omar El-Hussein is thought to have frequented a HUT-affiliated mosque where an imam held an anti-Semitic talk shortly before the attack, and the group has encouraged Danish Muslims not to distance themselves from the terrorist attack. But there is so far no evidence linking the Danish branch of HUT directly to terrorism, nor have the group or its members been charged with incitement of such acts. Moreover, the Danish Chief Prosecutor has twice investigated the possibility of banning HUT, and each time concluded that such a move would violate the Danish constitution’s guarantee of freedom of association (though the European Court of Human Rights has approved such a step in Germany). It is therefore clear that Danish politicians are targeting HUT for their obnoxious opinions and provocative statements, rather than any actual threats or illegal actions, much as France targeted people who defended but had no part in committing terrorism after the attack against Charlie Hebdo. Such a move demonstrates that a liberal democracy like Denmark is far less confident about the importance and supremacy of the values that its political order is built upon than one would assume. Banning religious fundamentalists like HUT would provide the group with a propaganda victory by allowing them to present themselves as martyrs and “exposing” the hypocrisy of a West that applies free speech selectively, benefiting “enemies of Islam” but exempting Muslims. The proposed crack down on HUT also marks a contrast to previous decades where Denmark allowed both communists loyal to Moscow and socialists parties committed to the idea of violent revolution to be represented in Parliament with no legal repercussions. These parties were ultimately defeated by a lack of popular support as their ideas were exposed to criticism and the laboratory of reality on the other side of the Iron Curtain. ISIS similarly is proving that the caliphate offers nothing but death and misery to Muslims and non-Muslims alike. If a liberal country like Denmark cannot also defeat the ideology of HUT without resorting to a ban, then it is the values of liberal democracy itself that will have failed. While the Danish government has signaled its intent to crack down on Islamists who attack cartoonists, it has refused to expand free speech for those who are the target of extremist violence. On 26 February the government announced its decision not to repeal the country’s blasphemy law following a recommendation from the Criminal Law Council, an expert body. The Danish government argued that since no one has been charged for violating the ban since 1971, it does not limit even harsh criticism and satire aimed at religion. However, following the lead of the Criminal Law Council, the government argued that a repeal would decriminalize such acts as burning or defiling “holy books” like the Koran and the Bible, which might lead to violent protests both at home and abroad. It is difficult to interpret the decision not to repeal the blasphemy ban other than as a form of appeasement of those extremists who are willing to use guns against those who use pens. In 2012 the same government – backed by an overwhelming majority – rejected a proposal to ban the burning of Danish flags, citing its commitment to free speech and the importance of being able to criticize Denmark, no matter how offensive the criticism. By providing special protection to the feelings of religious people, including people outside of Denmark, the Danish government is in practice caving in to extremists who are attempting to enforce blasphemy norms through violence. Equally damning is the failure to support and show solidarity with those who are targeted by blasphemy laws and the extremism that such laws seem to reinforce in countries like Pakistan and Bangladesh, where religious minorities and atheists are targeted both by blasphemy laws and violent extremists. The importance of repealing even inactive blasphemy laws in western democracies has been stressed by the UN Special Rapporteur on Freedom of Religion German professor Heine Bielefeldt, who has remarked that the “major damage done [by blasphemy laws] is the international one” since “those countries that continue to have an intimidating anti-blasphemy practice like to quote European countries to unmask western hypocrisy”. All in all the price of the terrorist attacks in Copenhagen may end up being paid not only with the lives of two innocent people, but also with some of the freedoms and human rights enjoyed by Danish citizens.